Douglas 0-2 – this is a recent donation to the museum and is a Liberty-engined biplane used primarily for Observation. It was involved in a fatal accident in the Boerne, Texas area in 1933 – after crashing it burned. So as you can imagine there isn’t a lot left of the airplane and precious little that may be useful in a restoration beyond patterns. 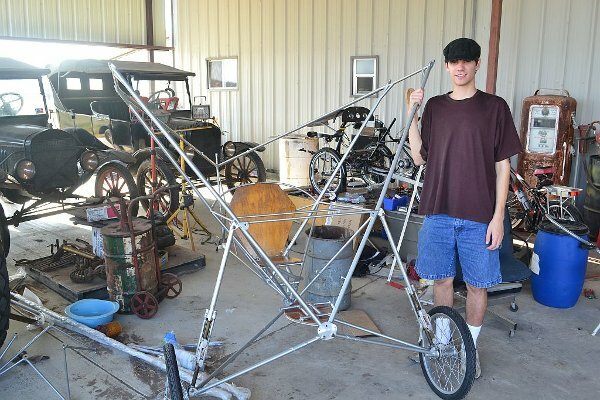 Nearly all the parts are fuselage parts – aft and forward center section along with a fair supply of engine parts, including an impressively bent crankshaft! Terry Bledsoe and Dave Orloff moved the parts from the trailer into a storage shed. Al Sumrall and Mike McCormick are working determining the aircraft’s specifics – so far Al seems to be cheating, relying on a friend who is turning out to be an outstanding researcher. Some of the basics are seeing the light of day, but it may well take Mike’s personal research at various facilities to fill in all the gaps possible. Fokker Dr.I Triplane – The day started with some bad news about the Triplane. The envelope which was ready to be glued on proved to be defective. Art Caballeros had applied the cheesecloth to the wooden turtledeck and cowling cheek pieces and then glued on the defective envelope. Roger and Art shrunk the fabric but as it sat the cloth went slack again – apparently the cover material we’d used on the envelope was defective. We were very fortunate that Diane Edgerly was available to come out to Kingsbury with her sewing machine to sew up a new envelope. Kevin Monahan, Diane, Dave Edgerly, and Roger worked to get the new envelope sewn up, glued on, shrunk, and the first layers of dope applied. Looking pretty darned good! Roger elected to do something different on the bottom surface of the fuselage this time around. Original Triplanes had a seam running down the fuselage centerline on the bottom and the edges were laced together. We had simulated that on the replica's bottom surface and Roger wants to try something new this time around – so as we left the Triplane Saturday evening the fuselage was covered on three sides only; top and the two sides! We’ll have to wait and see what Roger has planned for the fuselage bottom. 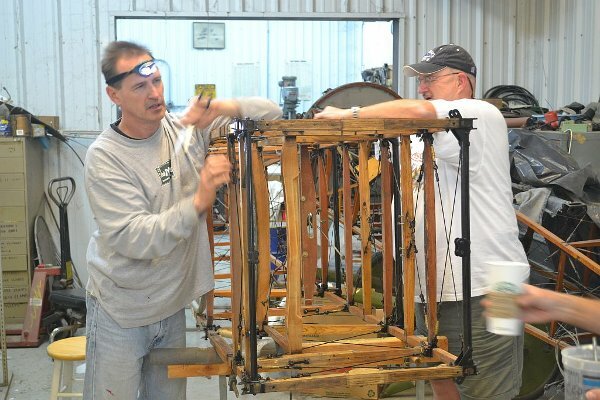 Thomas-Morse – Dave and Tom Miller went back to work on the T-1 fuselage, continuing to remove loose varnish, clean metal fittings and generally refurbish the forward end of the fuselage structure for painting and varnishing. They have been doing outstanding, meticulous work and I salute them for their patience and tenacity! Dormoy Bathtub – David and Ian Whittaker continued making progress on the Dormoy. A new cockpit “floor” board was cut, varnished and installed, along with the rudder pedals. They have also been making progress on covering the tail surfaces and late in the day they installed the new tail wheel. Cameron Whittaker with Al Sumrall as an accomplice continued to rebuild Model T electrical systems. I know the ambulance was driven around some in the afternoon and Al was practically prancing with delight over how easily the machine starts! Cameron has really done some outstanding work on the Ts. I believe I also saw a couple of motorbikes rat racing around the field during the day – couldn’t tell who was winning, the Maytag Motorbike or the Kingsbury Special? We’ll have to wait for Al to provide us all with full details.